Leah Monaghan and Barb Stauffer use pure botanicals and extracts in their flavorful small-batch mixers. Partake of a pear and rosemary Prosecco on the patio. Or a cucumber-habanero margarita, maybe? Crafted from organic cane sugar and pure botanicals and extracts, these small-batch syrups make enticing drinks mixed with your favorite liquor or non-alcoholic mixer. Syrup scientists Leah Monaghan and Barb Stauffer specialize in the farm-to-cocktail movement and have always relied on one recipe for success: whole ingredients, quality flavor, and local flair. 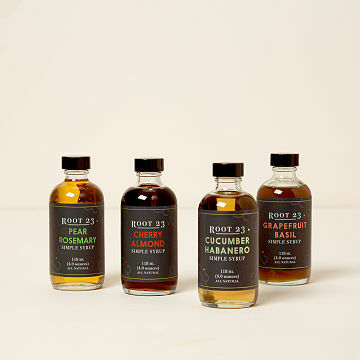 Their approach produces elixirs sure to delight flavor-focused foodies and adventurous mixologists. 4-ounce bottles. Handmade in Columbus, Ohio. Cherry Almond: Adds aromatic warmth to bourbon, vodka, or rum cocktails and a tart twist to mocktails. Cucumber Habanero: Cucumber lends a cool, crisp flavor, punctuated by a kick of habanero. Pairs well with white tequila, vodka, or citrus seltzer. Grapefruit Basil: Sour grapefruit compliments savory basil. Top with Prosecco or pair with gin, vodka, or tequila. Pear Rosemary: Sweet pear infused with aromatic rosemary makes for a refreshing cooler. Pairs well with gin, vodka, or Prosecco. Visit our blog for more on how Barb and Leah grew their business piece by piece—and learn how popsicles started it all. On a mission to balance family and work life, busy moms Barb Stauffer and Leah Monaghan wanted to create a rewarding, successful business that also provided an outlet for their creativity. Their passion for handcrafting delicious flavor combinations from all-natural ingredients gave their goal a definite shape. Their simple syrup line was the sweet solution. Their inventive infusions lend themselves to mixing delicious drinks with just a couple of additional elements. Each of Barb and Leah’s mall-batch syrups is created with organic cane sugar and ingredients sourced from local Ohio farms. Each bottle contains approximately 4-6 servings. Amazing gift, one of my favorite! I'm never one to write reviews but I absolutely love these syrups. They mix very well with just about anything. I love experimenting with craft cocktails and these transcend a drink! The cherry almond is awesome with an old fashioned and I've mixed every flavor into a fresh margarita and just a little goes a long way. This was one of my favorite Christmas gifts:) Thank you guys so much! Great to treat guests at the holidays or enjoy anytime! Add to bubbly for a delicious (and easy) cocktail or follow one of the many suggested recipes. This is a treat we enjoy at our home and are happy to share with friends! A gift for that person who isn't easily surprised yet was surprised and pleased. My boss loved this different holiday gift! I purchased this a gift for my boss, who lives in another state. I liked this as a gift because it is made here in Ohio, and because it is not your ordinary holiday gift. My boss loved it and has been raving about the flavors! perfect size to try different flavors; makes a perfect gift! perfect size to try different flavors; makes the perfect gift! My sister loves the simple syrups! She really enjoys making special cocktails for her friends and had fun incorporating the various flavors into her drinks.